ThreeHundredEight.com: What is going on in Alberta? You know things are strange when it seems even pollsters can hardly believe their own numbers. In Mainstreet's latest missive, we're told to prepare for some 'drastic swings' in the coming weeks. ThinkHQ cautions us that we 'need to be careful about reading too much into the early horserace numbers'. I'll add to that sentiment. Everyone in Alberta polling was already spooked by 2012. This sort of terra incognita is just terrifying. Here be dragons, folks. It isn't that the polling is contradictory. Quite the opposite, and that makes it even more off-putting. Predictable Alberta is being turned upside down, and who knows what will fall out of it. 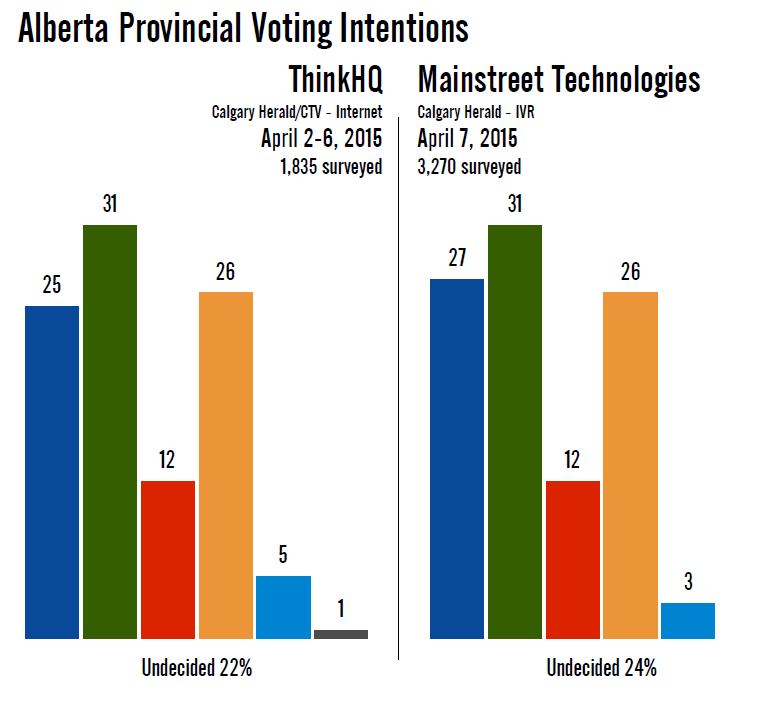 The Calgary Herald is doing double duty on Alberta polling these days, coming out with new numbers from ThinkHQ last night (also reported by Metro Calgary and CTV) and then even more new numbers this morning (here reported by the CBC) from Mainstreet Technologies. And the two polls, one conducted online and the other via IVR, showed virtually identical results. Wildrose scored 31% in both polls, with the Progressive Conservatives and New Democrats only a point apart for second place. ThinkHQ had the NDP with 26% to 25% for the PCs, while Mainstreet had the PCs at 27% and the NDP at 26%. Both polls also put the Liberals at 12% support. There is a lot of agreement to go around, but these numbers are unprecedented. In my Alberta polling archive going back to 2008, I have no poll showing the PCs in third place, and only in the darkest moments before Alison Redford resigned have the Tories polled this low before. In none of these polls going back seven years has the NDP even managed 20%, but here they are at 26%. From an electoral perspective, the last time the New Democrats took this much of the vote was in 1989. This is not to say that the polls are unbelievable. With the Insights West poll from last week, we now have three separate pollsters showing broadly the same thing. Jim Prentice has gambled on an early election, and the first roll of the dice is looking very bad for him. Wildrose has recovered, certainly, but at 31% is still below where it stood on election night in 2012. They are benefiting from the PCs' slide by default, as the NDP makes important gains. Regionally, the two polls are also in broad agreement, though it should be pointed out that ThinkHQ reported the results for the cities of Edmonton and Calgary only, rather than the wider CMA. And ThinkHQ had no results for the rural parts of Alberta. Nevertheless, both polls showed strong results for the NDP in Edmonton (42% for ThinkHQ, 20 points up on the Tories, and 52% for Mainstreet, 31 points up), with a close race between the PCs and Wildrose in Calgary. Mainstreet gave Wildrose a sizable advantage outside of the two main cities. As the projection suggests, this makes for a confused race. Though marginally ahead in the popular vote, Wildrose is projected to take between 18 and 38 seats, or 25 more precisely. That gives the Tories the edge on winning the seat count, with between 20 and 49, or 35. This is in large part because of the PCs' lead in Calgary, which alone provides them with half of their seats. With enough residual support to retain some seats in Edmonton and the regions, this gives them the edge. But it is a knife's edge, because there are a lot of very close races. The maximum and minimum ranges show just how many, with the PCs projected to take between nine and 61 seats, and Wildrose between eight and 55 seats. In other words, more than half of the 87 seats up for grabs could swing between Wildrose and the PCs with only a small shift in voting intentions. The NDP has more surer footing, since its vote is so concentrated in Edmonton where almost all of their projected seat wins are located. But if the NDP is really moving into contention, it opens up a lot of possibilities for them. And this is likely at the detriment of the Liberals, who are probably being over-estimated in the model (which is only karma as the model under-estimated them in 2012). This is a nightmarish scenario for pollsters. With three parties so close to each other, pollsters could easily get all three parties within the margin of error and still miss the order entirely. And with so many close races, the seat projection model is really going to be blowing steam out of the hinges. Will it hold, though? It is hard to imagine that such a close three-way race would be able to sustain itself for the next month. Voters tend to go one way or another en masse at some point. And ThinkHQ found that 19% of Albertans said they strongly agreed they could change their mind, while another 39% said they somewhat agreed. That mean 58% of Albertans are considering their options. Perhaps we should indeed expect some drastic swings, then. Not giving any confidence to my projections, I just want to see if my simple formula can be a good shorthand. I think this election will be different because of the nature of the NDP growth. I think this time instead of the NDP and Liberals going on masse to support the PC's it will be Wildrose jumping to the PC's in the belief that the right-wing vote will be split and an NDP government might squeak in or get too close for comfort. The point re the Liberals is that in 2012, their vote collapsed everywhere except where they had an incumbent. Three more of their five incumbent MLAs are gone this time around, AND they're facing much stronger competition for the voters who will be left. They could very easily be squeezed out as Election Day nears. Swann and Blakeman are likely to win their seats. If the L:iberals can capture 10% of the vote in 2012 that is likely their minimum. Alot of the Calgary-McCall Liberal vote and Edmonton-Meadowlark Liberal vote were a Darshan Kang and Sherman vote but, the same can not be said for Kent Hehr in Calgary-Buffalo whose seat they are likely to retain. The problem with your Liberal vote slippage theory is that it also works the other way round: The NDP for the most part is an Edmonton-centric party left leaning voters in Calgary and the rest of Alberta may well feel their best bet to turf the PCs, prevent a Wildrose Government and elect a centre-left government of some variety is their Liberal candidate. If the 2012 election demonstrated anything (other than the unreliability of the polls), it's that it is quite tough to knock out AB Liberal incumbents. I'm not disagreeing with that, but now three of those five MLAs are gone. Blakeman, however broad her appeal might be with other centrist parties, is sitting squarely in the path of that ANDP surge in Edmonton. It's a very real possibility that only Swann might be left after Election Day. Absolutely, the ANDP has work to do on growing their vote outside Edmonton, but the mere presence of a successful bandwagon somewhere will encourage more voters to jump aboard anywhere. The problem with your Liberal miraculous comeback theory is that, since the party is now in fourth place, they're now vulnerable to their own favourite line of attack: that they are splitting the vote and helping to elect a right-wing government. I see your projection has the Liberals in the lead in the riding of Edmonton-McClung. This intrigued me so I checked out daveberta.ca (if you aren't following him, please do so. The most authoritative political blogger in Alberta and chronicling all the candidates in this election) to see who the candidate in that riding was. Turns out they don't have one (yet). It just goes to show you the state of the Alberta Liberals that at this point they don't even have a candidate yet in a riding that they held as recently as 2008. Praise be to the Lord of Light, for the night is dark and full of terrors. Sorry couldn't resist! Lol. I definitely think it's a crapshoot right now. Even if the polls are 100% accurate, FPTP doesn't do a reliable job in mapping votes to seats. The NDP could come first on votes and third on seats depending on the distribution of their support. The same could happen to the PCs or Wild Rose. And I don't think the polling is of sufficiently high quality for you to be able figure out that riding level distribution with a high degree of certainty. I'm calling it now. WR Majority. Strong NDP opposition. PCs and Liberals largely destroyed. It's 1935 all over again. Not sure of what to make about Google Surveys just yet. But if it was commissioned by a media outlet, I'd include it. This, though, has been commissioned by an interest group. As a rule, I only include polls that are commissioned by the media or published independently by polling companies. Its definitely reliable as a poll, it has a legit methodology and isn't a voodoo poll of any sort, so on that basis alone I'd include it. But as you said, Eric, it is from an interest group. Even with good methodology and interest group can run multiple polls and only release the one that favours their narrative. And the corporate media are not an interest group? dl, hah hah Quite right. Your model assumes that Liberal vote efficiency will scale up. This does not reflect what happened last election and what is happening this election. People voted for a Liberal incumbent where one was available, and otherwise for a PC candidate to stop the WRP from taking power. Without most of their incumbents this time around, the Liberals will probably not retain those seats. A progressive voter would be drawn to the NDP, or possibly the PCs if the WRP look too strong. These polls create a feedback loop that then changes the voting intentions of certain types of voters. That is why the election day outcome is doomed to be different than the polls. Éric acknowledged that when he launched his Alberta 2015 coverage. The Liberal results in 2012 were driven primarily by their super-incumbents, most of which are now gone. I think 2 seats is about right for the Libs. FPTP can produce disproportionately large seat swings on shifts in the order of 3% or less. PCs could stay home while Wildrose turn out in droves. The NDP is hoping to retrieve supporters who voted Redford to head off Wildrose last time around. What's interesting is that the Liberals may not even have a full slate of candidates. They have until next Friday, April 17th to submit all of their candidates to Elections Alberta. So far they only have 36 candidates nominated while the PCs and NDP have full slates. Wildrose isn't too far behind as they are getting close to 70 candidates. The model may have to remove some Liberals entirely from ridings. I heard in a few they may deliberately not put forward a candidate where the NDP or Alberta Party have a good shot. Calgary-Fort, where a former city councillor is running for the NDP, and Calgary Elbow, where the Alberta Party leader is running. The Alberta Liberals haven't been a meaningful contributor to Alberta politics since the Grant Mitchell debacle. You Eric, and your commenters are thinking only two dimensional, why, what, how could the polls be this way.. Recent events tell us why the current polls are accurate.. The PC`s had a majority with Redford...Queen Allison spent like it was her money, wined and dined her loyal subjects, including her family tree.....She was turfed..
Wildrose opposition party saw Danielle Smith and her high lieutenants jump ship for power, and for more money..
That move destroyed Danielle Smith`s and her fellow traitors future political careers..
Down crashes oil....money dries up...Wildrose, such as it was....They campaigned like a party of oil executives, their entire campaign was one of bowing to big oil..Thus, with the crash of oil people NOW see that Wildrose was off-base, confused priorities.. Instead of everyone chipping in, high earners, corporate earners, corporate taxation, royalties..
What you have is Jim Prentice saying it`s business as usual for the corporates....The future oil returned will be managed better but from here on out taxes are going to pay for everything, not resource revenues..
That combined with Harper bringing in income splitting for Canada`s wealthiest, along with Harper double TFSA(tax free savings account)...Another tax measure where mostly well-to-do folks will be the ones to take advantage..
Why the polls are confused is because the Alberta public have been presented a picture of the future...Taxes, taxes and more taxes for average joes while the corporates carry on with business as usual...Combined with a politician promising not to spend the gravy next time round..
A minority Wildrose victory....PC`s in second place, NDP a close third..
and every floor crossing Wildrose member who betrayed their party and joined with Prentice will be punted right out of office, probably forever. I’m not convinced that Alberta is about to go en masse to the NDP. The NDP often has the luxury of other people not taking them very seriously, whether to form government or the official opposition, so NDP platforms are usually not scrutinized very closely, whether for practicality or costs (this ultimately hurts them when they do occasioanlly slip into power). Given the early hype they might not have that luxury this time and people’s enthusiasm will start to wander other places over the course of 30 days as people start wondering about thei r taxes and jobs. If David Swann does a decent job as Liberal leader I think votes will start drifting back his way as people contemplate a path between PC and NDP. I think a majority/minority Wildrose or PC government with a fractured center/left opposition (again) is the most likely outcome after 30 days at this point. I agree with your assessment except the campaign is only 28 days long! I'm wondering how many of the left leaning voters will jump to the NDP at the last minute if they think the NDP could actually win the province. The idea of the PC & Wildrose both being on opposition benches might be too much to resist for those voters. The mind blowing shockwave an NDP win in Alberta would cause would be fun to watch. We'll have to see how the polls go but, a NDP government is very unlikely. They simply don't have the support necessary in Calgary or the rest of Alberta to win a plurality. The Alberta NDP have always been an Edmonton party fueled by unionised civil servants, the polls today look no different. If the PCs go to the opposition benches that almost guarantees a Wildrose victory and vice versa. The concentration of NDP support in Edmonton makes their vote really efficient at low levels, and really inefficient at high levels. Yes, but it's rather uncertain what the higher levels of NDP support will translate into in Calgary and the Rest of Alberta. It could very well be that a surge in NDP support only affects Edmonton, central Calgary and Lethbridge. It could also be that a surge in NDP support yields no gains in Calgary too. Basically, we have no idea what an NDP surge will mean with regards to Calgary seats (centre vs. suburbs for example). But it's pretty clear that in the Rest of Alberta, only Lethbridge is in play. Provincewide, it makes their vote very efficient at low levels and inefficianet at high levels but, always inefficient in Edmonton. My point is that it's entirely possible that the NDP could win the popular vote and sweep Edmonton, but win almost no seats outside of Edmonton. Eric Did you see that Senators - Rangers game ??? WOW ! !